Exiled Tibetan spiritual leader the Dalai Lama will meet President Barack Obama at the White House on Friday, US officials say. China has urged the US to cancel the meeting, saying it will “seriously impair China-US relations”. China describes the Dalai Lama as a separatist, while the spiritual leader says he only advocates greater autonomy for Tibet, not independence. Officials say the US does not support Tibetan independence but is concerned about human rights in China. The two men last met in 2011, in talks that angered China. Tibet is governed as an autonomous region in China. 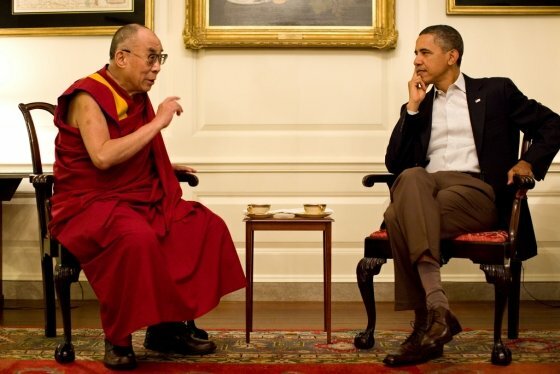 Barack Obama will host the Dalai Lama in a private meeting in the White House Map Room on Friday morning, US officials said. The president traditionally hosts foreign leaders in the Oval Office, so the decision to use the Map Room is viewed as an attempt to give the visit a lower-profile. Caitlin Hayden, a spokeswoman for the National Security Council, said Barack Obama would meet the Dalai Lama “in his capacity as an internationally respected religious and cultural leader”. Meanwhile, Chinese foreign ministry spokeswoman Hua Chunying said that Beijing was “firmly opposed” to the meeting. “The US leader’s meeting with the Dalai is a gross interference in China’s internal affairs, a severe violation of codes of international relations and will seriously impair China-US relations,” she said in a statement. China had “already lodged solemn representations” with the US on the matter, Hua Chunying added. The Chinese government accuses the Dalai Lama of orchestrating the protests, a charge he strongly rejects.